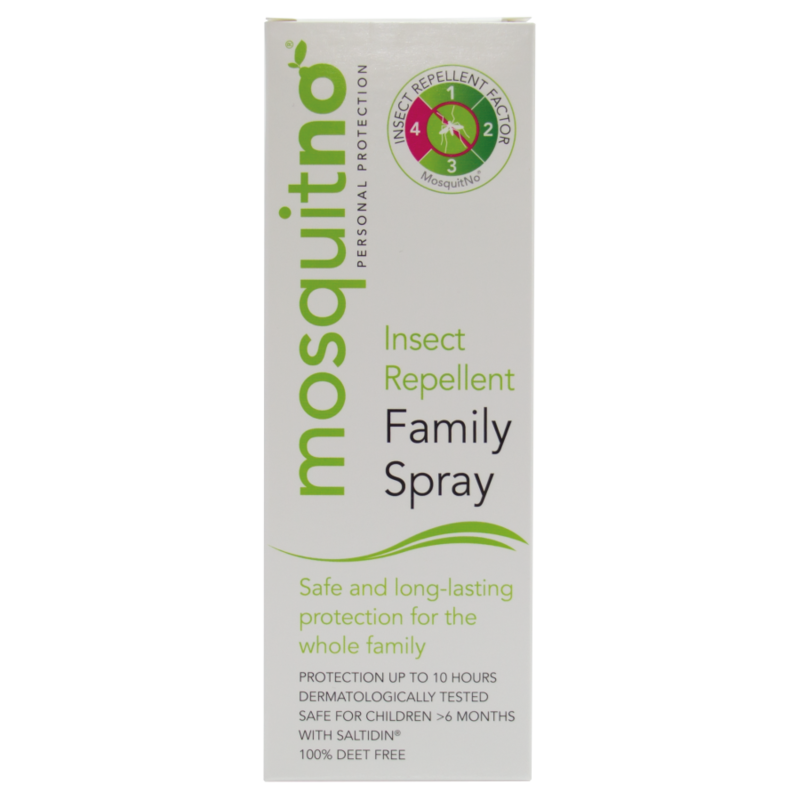 MosquitNo Insect Repellent Family Spray offers protection for the whole family during your holiday and outdoor activities. Keep your family safe during picnics, hiking, swimming, camping, etc. 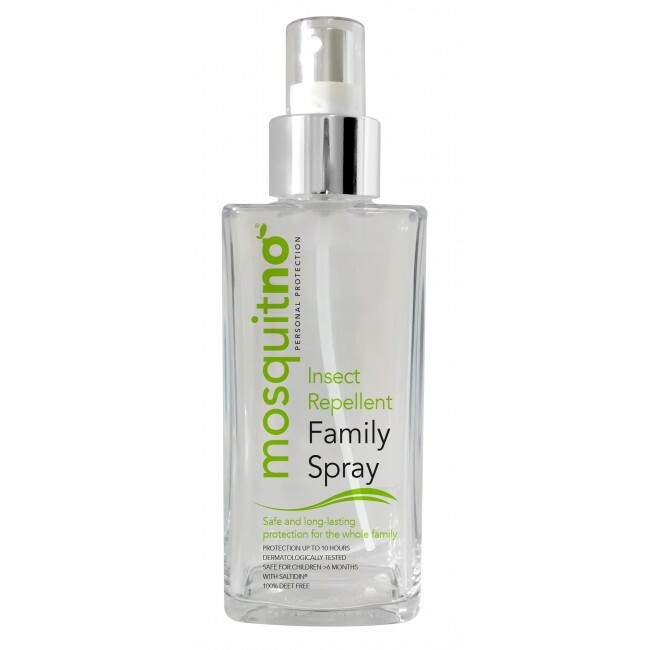 The spray for your skin offers protection against mosquitoes for up to 10 hours! The active ingredient, 20% Saltidin®, is 100% safe for children aged 6 months or older. It has been dermatologically tested and is safe for the environment. It’s proven effectiveness against mosquitoes, horse flies, sand flies and midges will ensure a carefree time outdoors. Use the MosquitNo Insect Repellent Family Spray anywhere you go. 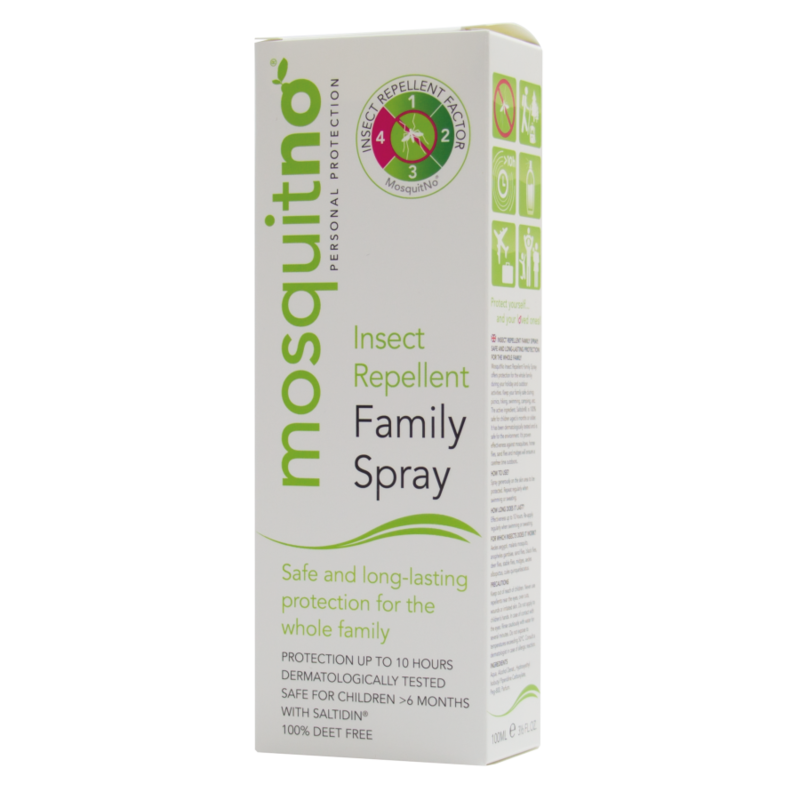 • MosquitNo Insect repellent factor 4: Long-lasting Protection! HOW TO USE? Spray generously on the skin area to be protected. Repeat regularly when swimming or sweating. FOR WHICH INSECTS DOES IT WORK? Aedes aegypti, malaria mosquito, anopheles gambiae, sand flies, black flies, deer flies, stable flies, midges, aedes albopictus, culex quinquefasciatus. PRECAUTIONS Keep out of reach of children. Never use repellents near the eyes, over cuts, wounds or irritated skin. Do not apply to children’s hands. In case of contact with the eyes: Rinse cautiously with water for several minutes. Do not expose to temperatures exceeding 50°C. Consult a dermatologist in case of allergic reaction. INGREDIENTS: 20% Saltidin® (Hydroxyethyl Isobutyl Piperidin Carboxylat). Aqua, Ethanol (alcohol denat), PEG-8, Parfum.